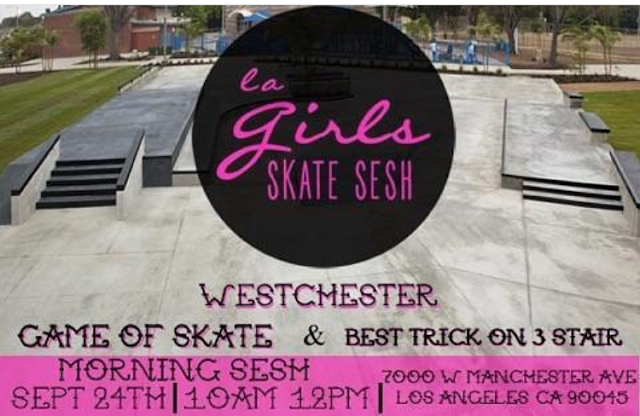 Girl is NOT a 4 Letter Word: LA Girls Skate Sesh This Saturday! LA Girls Skate Sesh This Saturday! Get ready because LA GIRLS SKATE SESH is having another Saturday get together! This time at Westchester Skatepark. Bring your board and your girl friends and get ready to shred! What: A game of skate and best trick on the stairs - there will be prizes!! What else: They will also be selling their new tie-dye T-shirts so bring some cash if you want one- they are badass! !